Multi-resistant bacteria represent a major problem not only in hospitals but also in animal husbandry. 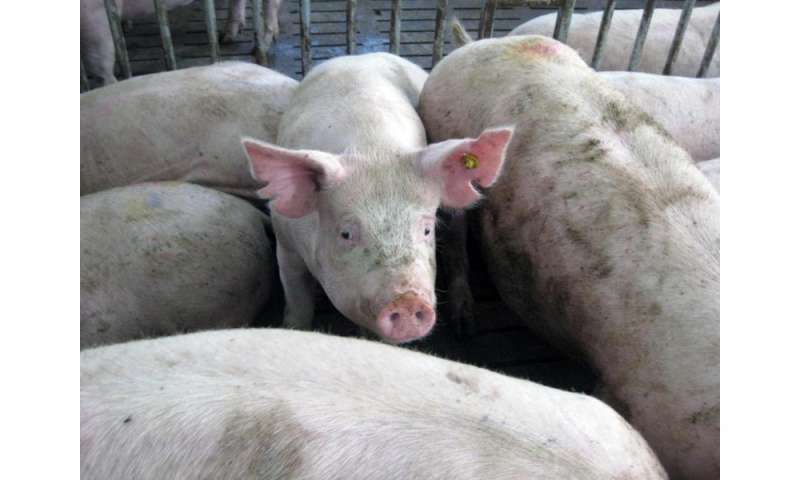 A study of the University Bonn describes how a farmer successfully eliminated these pathogens entirely from his pig stable. However, the radical hygiene measures taken in this case can only be applied in individual cases. Nevertheless, the work has yielded a number of recommendations – not only for farms but also for hospitals. The study appeared in the Journal of Applied and Environmental Microbiology. Today some farms are implementing measures more frequently found in an operating theater: To enter the stable, employees have to change clothes. Before and after visiting the stables, hands must be cleaned thoroughly. Newly purchased animals are quarantined immediately. Particularly careful farmers arrange regular microbiological screens for resistant bacteria for themselves and their staff. The purpose of these measures is to prevent the spread of dangerous pathogens – in particular multi-drug-resistant bacteria. Under certain circumstances these bacteria are dangerous, because infections are difficult to treat with antibiotics. Two major problems are posed by methicillin resistant Staphylococcus aureus (MRSA), and certain intestinal bacteria which produce extended-spectrum beta-lactamases (ESBL). Even the strictest precautions against these bacteria are often not 100 percent successful, because these pathogens are found not only in humans and animals but also on walls and even in the air of the stable. In a previous study, researchers at the University of Bonn found MRSA on every fifth pig, and an ESBL rate of 30 percent. For the first time, researchers have successfully demonstrated that multi-resistant bacteria can be eradicated from a stable. "But these radical steps can only be implemented in very few cases," says the agronomist Dr. Ricarda Schmithausen of the University of Bonn. As part of the study, the stables of the farmer were completely renovated and an additional new stable was built. The measures were accompanied by a multi-level disinfection process. This would have been impossible during the daily routine. The farmer had planned a conversion of his farming system and therefore had previously slaughtered his entire herd and then restocked with pigs. The newly purchased animals were tested randomly to prevent the introduction of new resistant bacteria. The measures were successful, according to Dr. Schmithausen: "Today, two years after decontamination, the farm is still ESBL-free. MRSA, unfortunately, was a different story: Only two days later another MRSA variant was detected. Presumably, the new MRSA bacteria were introduced by one of the animals. In spite of all tests this cannot be avoided." Nevertheless, the health of the herd has improved significantly. As a result, the use of antibiotics is hardly necessary any more. MRSA are first and foremost pathogenic for humans and are largely harmless for animals. Previous studies by the University of Bonn have shown that farmers carry multi-resistant bacteria more often than the general population – as a result of their close contact with animals. The colonisation remains mostly asymptomatic for farmers. However, it can be dangerous, if the pathogens are transmitted to immuno-compromised patients in hospitals. The agronomist and physician Dr. Ricarda Schmithausen defends the farmers. "Most cooperating farmers are very well informed and act very responsibly concerning this issue by implementing high hygiene standards" she emphasizes. The risk that MRSA and ESBL-E bacteria will spread further can be minimized through normal measures but cannot be reduced to zero. "Hospitals and livestock farms fight the same problems," she says. "Both sides can learn from each other – hospitals could, for example, screen inpatients more consistently for multi-resistant bacteria."